You have likely heard about some of the private concerts and celebrity guest appearances that occur at corporate events. It is becoming more common for corporations to hire big names for their thank you events and product launches. Not only does this approach draw more media attention, but it also boosts employee morale. But what if you can’t afford an appearance from Bon Jovi or Beyoncé? Not to worry, as there are plenty of affordable options available. Often times you can look right in your own backyard to find a talented array of musicians and performers. Look through community calendars and bar entertainment listings to see who is repeatedly playing the big events. Another angle is to search local schools and colleges for stars-in-training. Choir groups, piano players, and dancers can all be found at schools with strong performing arts programs. Booking a Marilyn Monroe impersonator for your event can be just as fun as the real thing if you find the right person. One of the drawbacks to real celebrities is all the security and contractual terms associated with their appearance. Impersonators are much more likely to interact with your attendees, pose for pictures, and take on special requests. The money you save using an impersonator can even allow you the flexibility to add more personalities to the event. Imagine having Michael Jackson, Madonna, and Jerry Seinfeld all show up on the same night! When you think about B-list celebrities like reality stars and sports coaches, they tend to have a more human experience to them. A lot of the names in this category are just regular people who worked hard to a get a shot at doing what they love. Stories like this often fit business-related event themes more seamlessly than the “paid spokesmen” model. Successful coaches know what it takes to succeed, and reality stars understand the difficulty in maintaining relevance. Finding a second tier celebrity whose background matches your theme can help you create amazing content for your guests. Why hire anyone to entertain your guests when you already work with some of the most talented people around? Employee talent shows draw an instant connection with the audience, and the entertainment value will last for weeks at the office as people marvel at the unique skills their co-workers were hiding from them. If you’re really lucky, you might be able to entice the CEO or executive to put together an act! 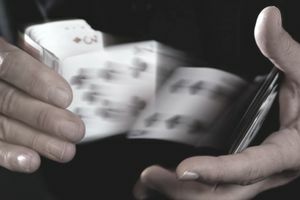 Magicians, hypnotists, and even fortune tellers have been crowd-pleasures for centuries, and the best ones can entertain even the toughest crowds. Here is another opportunity where, with a little creativity, you can integrate the core message of your event into the performance. Wouldn’t it be great to see a VP getting hypnotized…or watch as the office manager disappears from the stage? Food is going to be a hit at any event, which is why incorporating a culinary theme is one of the safest entertainment options available. There are several options for doing this, both on a small and large scale. You can run a cooking demonstration on stage as a featured segment, or even bring in a well-known chef to share cooking secrets. If you have the space, think about expanding the culinary theme by creating food stations that feature samples and demonstrations from the best restaurants in your city. This idea can also be consolidated to just dessert and paired with a silent auction or giveaway contest. The thing to remember about all of these event entertainment ideas is that you have plenty of choices as the event planner. For every obstacle you face booking one, several other options will open for you. The best way to brainstorm ideas is to begin with your theme and think about what form of entertainment best matches it.